SIR HENRY VANE (1613-1662). Vane, an English Parliamentarian, was a leading minister under James I and Charles I. His early sympathies with the Puritans led him to immigrate to America in 1635, and the following year he was chosen governor of Massachusetts. His advocacy of religious tolerance cost him his popularity, and he returned to England in 1637. There Vane served as joint treasurer of the navy from 1639 to 1641 and was knighted in 1640. Although a leader of the parliamentary side in the conflict between Charles I and Parliament that led to the English Revolution, Vane remained a monarchist. In 1643, he was the English Parliament's chief negotiator of the Solemn League and Covenant with Scotland. After the execution of Charles, he became a leading figure in the Commonwealth and an intimate of Oliver Cromwell. Upon Cromwell's dissolution of the Rump Parliamentin 1643, however, the two became enemies and Vane was imprisoned in 1656. He returned to Parliament during 1658 and 1659. After the restoration of Charles II as king in 1660, he was suspected of having plotted with General John Lambert to institute a dictatorship; he was imprisoned and executed for treason. SIR HENRY VANE. DS. 1pp. 7 1/4" x 11 1/4". Westminster. October 1, 1648. 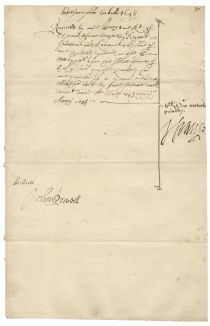 A document signed "H Vane" in bold letters. Vane receives a payment. A rare document signed by one of America's earliest Colonial governors after his return to England during the tumultuous period leading up to the English revolution and Oliver Cromell's ascendency to power. A fresh, clean document in excellent condition.